A doctors surgery has come top of the league after their team’s family philosophy saw them rated highly by patients. The Hodgson Medical Centre in Hodgson Avenue, Werrrington, came top of the charts based on ratings provided by patients. 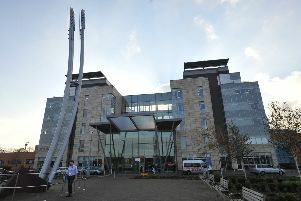 Vijay Iyer, senior partner at the practice, said all staff at the centre tried to treat the patients with respect. He said: “I don’t think we do anything special. “We just try and treat everyone like they are part of our family. “It is a real team effort, with everyone having the same job, starting at the front desk. “We have a great team, and we always do the best we can. The centre came out on top based on responses provided in the GP Patient Survey for those surgeries within a five mile radius of PE1. Patients completing the survey are asked how likely they are to recommend their practice to others. The survey is sent out twice a year to about 1.36 million adults who are registered with a GP in England. Hodgson Avenue’s ratings saw 92.7 per cent of patients saying they would recommend the surgery to others. Thorney Medical Practice came second on the list, with 91.5 per cent of people recommending it. The two surgeries at the bottom of the Peterborough list were the Welland Medical Practice and The Church Walk Surgery, both scoring 48.6 per cent. A total of 33 surgeries were given a rating in Peterborough. To find out the rating of your nearest practice, or for more information about the survey, enter your postcode at www.nhs.uk. How does your GPs practice rate?